CFA students occupied their school in April, and threatened to do so again in June before DPS announced CFA would remain open—as a charter school. Emergency Manager Roy Roberts said June 16 would be the last school day ever at Catherine Ferguson Academy. An hour before hundreds gathered to rally outside the school, Roberts reversed his decision. CFA is one of three schools in the country that serves pregnant and parenting teens—and the only one with a full-fledged farm. 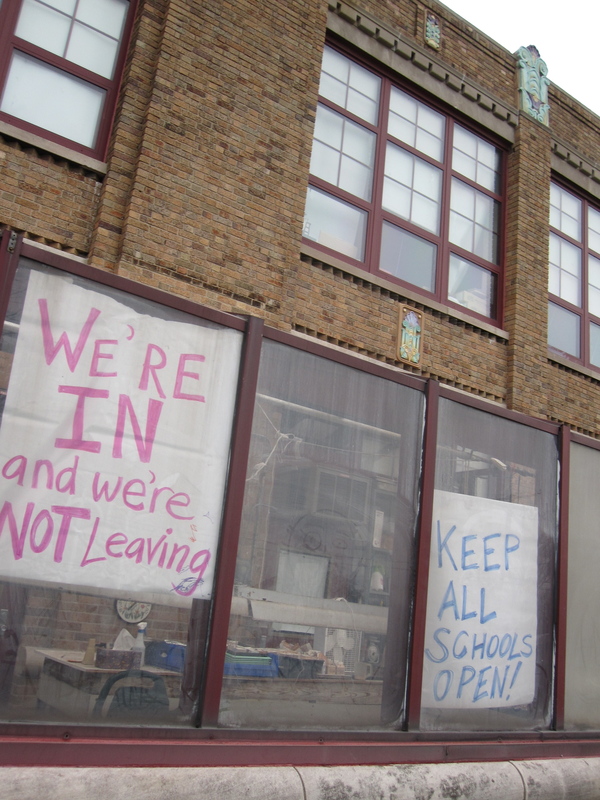 The school has been no stranger to national attention, but received it again after students and a teacher organizer were arrested for occupying the building in April. The night before the June 16 rally, they voted again to occupy. Instead, the protest became a celebration. An eclectic group of supporters came out—unions, congregations, longtime leftists, youth groups, and lots of gardeners. CFA supporter Danny Glover flew in on a redeye. Mind-numbing protest chants were replaced by laughter and conversations about the school’s future. But a low rumble of unease filtered through the crowd. Was this a victory? CFA will be handed over to Evans Solutions, a Detroit-based for-profit charter company. Principal Asenath Andrews and “core staff” will stay. The school will keep serving pregnant and parenting teens and their children. Teachers will have no union unless they organize, and the school will be another casualty of the commons. “I’ve always been proud to say this is a Detroit public school. So it’s kind of bittersweet for me to not be able to say that anymore,” said Science teacher Nicole Conaway at the rally. It is unclear how and why the last-minute agreement with Evans Solutions—which is run by the brother of former Police Chief Warren Evans—came about. Two prior charter bids on CFA were rejected as “financially unsound,” and DPS was poised to close the school citing its high per-pupil costs. The charter and CFA know each other. Students from Evans’ Blanche Kelso Bruce Academy traveled with CFA students to South Africa last year. Charter CEO Blair Evans is interested in agriculture, which bodes well for CFA’s farm. He connected his teachers to a permaculture certification training last April. School Board Representative Elena Herrada described the CFA situation as a “dubious victory,” rejecting the false choice between closing schools and privatizing them. Evans Solutions is also trailed by some skeletons. Doris Bennett, a social worker at one of Evans’ schools, was fired after being diagnosed with breast cancer and filing for treatment leave. The school was forced to pay Ms. Bennett $47,500 to settle her suit. Teachers and organizers in Highland Park recount the company’s ill-fated stint managing three charter schools there. One organizer described the company as “incredibly crooked.” At Northpointe Academy, the company lasted two years before the school’s board dropped them. “They were in it strictly to make money,” a Northpointe teacher says. Under Michigan’s emergency rule, one person made the final decision on CFA, but the mobilization by students and community altered that decision. An odd scenario remains: a former auto executive will continue to run our schools according to his whims. But the story of CFA proves we can bring our visions to bear on those whims. Our schools continue to be sold off—even those with the most valuable education models, and those where 90 percent of students graduate. Our unions continue to get busted, and our youth shuffled eternally. Four days after the CFA victory, Roberts, Governor Snyder, and US Secretary of Education Arne Duncan continued the endless rollout of “reforms” that only exacerbate the district’s various deficits. Public schools are under such wide-ranging attacks that it may be difficult to see promise in the provisional victory at CFA. But listen to members of the school family who have been empowered by the effort to save the program. Downplaying their commitment, and the energy that will continue to radiate around Catherine Ferguson, can only hurt the long-term struggle for public education. ← Rally for Catherine Ferguson! How things turn out for CFA is entirely dependent on whether or not the students and their supporters stay mobilized to enforce their petition demands: No cuts in any of the current programs and restoration of some programs recently cut; maintenance of the character of CFA as a relatively free, supportive environment, all staff and students retained – no retaliation against occupiers, etc. We are a factor, not just passive observers, of how history unfolds.